The original idea was to grill some gorgeous scallops and build a petite sandwich in the style of the super-popular Vietnamese Banh Mi. My dilemma was how to make a scallop slider with the correct balance of bread-to-scallop. Slider buns or rolls can readily be purchased at the supermarket or bakery. But those buns are still way too big to fit a single sea scallop. After many phone calls to my friends (bakers and chefs), I decided to try manipulating Pillsbury® Refrigerated Crescent Dinner Rolls. Baking from scratch was not an option, as I was teaching a Cooking Class highlighting grilling (not baking). And it was important that the participants be able to easily re-create all the dishes. I unwound the individual rolls, cut the dough in half, then reshaped and baked it for 12 minutes. Voila! The result: perfect scallop-sized buns. Just before serving, the mini buns were sliced, both sides of the interior brushed with a bit of butter, then toasted. Dry pack, wild caught Atlantic sea scallops have a sweet, rich buttery taste. They contain no preservatives or additives and do not ooze liquid during the cooking process, unlike wet scallops that have been soaked in a phosphate solution. The scallops are simply tossed in olive oil with a bit of sea salt and fresh ground pepper, then grilled on the BBQ using a grill pan over high heat for about 2 to 3 minutes per side. Simple, smoky, and sumptuous! Boil vinegar with water, sugar, and salt. Stir until sugar and salt are dissolved. Let cool slightly. Place carrot ribbons, red onion, and radish into separate glass jars. Pour vinegar mixture over the vegetables. When mixture comes to room temperature, cover and refrigerate overnight or longer. Prep all ingredients, grill the scallops last. Spread sriracha mayonnaise on the toasted buns. Layer cucumber, carrot, radish, cilantro, jalapeno, red onion. Grill scallops then assemble the sliders. Use a decorative pick to secure sandwich and serve immediately. We demonstrated these sliders as one of the dishes at a really fun Cooking Class Fundraiser last weekend. They were a big hit – with all the flavors, textures, colors, and adorable size – of course they were! Extending a very special thank you to super-gracious hosts Tracy & John, all the enthusiastic participants, and to my awesome talented team: FA, Jon, and Marlene. You rock! Oh my, you are so clever. What a beautiful and I’m sure delicious recipe. These look just beautiful: now to work out how to make such beautiful tiny slider buns out in the Australian countryside 🙂 ! Love! What a wonderful party idea! Yes, lucky John and I (along with a few close friends)! We were the participants in Lori’s cooking class/dinner and these sliders aren’t just gorgeous but they are scrumptuous to the last bite! We couldn’t get enough of them! John is going to fire up the grill and make these for our family and friends! Thank you Lori for another AMAZING (and I do mean, AMAZING) dinner! Thank you Tracy – you are so sweet. I think it was a great time all around! And we adore cooking in your gorgeous kitchen. Did you design that island for a cooking class? 🙂 Be sure to let me know when John makes the scallops, and congrats to all the guys in the Cooking Class, what a fun group! Will we do it again next year…four in a row??? Excellent idea and lovely presentation! Interesting concept, but I don’t think Choux pastry would not hold the crunchiness to serve banh mi style. Hi Thao – give it a try, I think you will be pleasantly surprised! Hi Cristina – of course the baker in you saw choux…now I see it too. With your expert baking skills, you do not need to use Pillsbury from a can, in fact, I can’t imagine that is available in Paris. 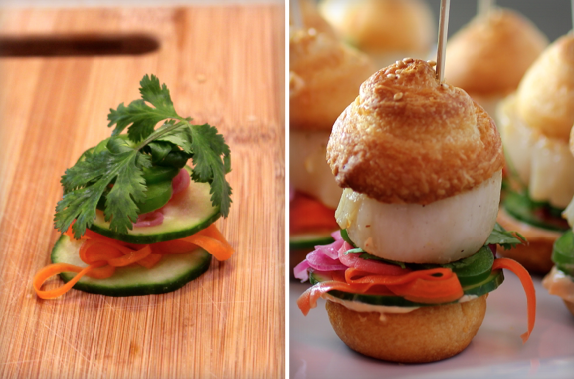 Please make the choux sliders and let me know how they turn out…scallops paired with the banh mi vegetables really make a terrific mini sandwich! What a fantastic idea, LL! And beautifully executed, of course. Happy Sunday. What a beautiful dish! Your guests must have flipped for these. My compliments! I have a stupid question…I really do not understand how you cut the rolls to make the mini? any help would be appreciated! Hi Peg – the Pillsbury Crescent Dinner Rolls come in a cylinder. Once open, the dough can be separated into 8 pieces. I took each piece, unrolled it into strips, then cut the strip in half. Then I re-rolled the dough to make buns half the size, and got 16 buns. Then baked for 12 minutes. It worked great. We sliced the baked buns in half right before serving, brushed with butter and put in the toaster. Oh, I also sprinkled a few sesame seeds on the raw dough. I hope that helps. PLease let me know if it still unclear. So easy, great result! Wow…i am so impressed that you not only responded ..but so quickly! thank you so much…. It’s OK Peg. I think you need to buy the Pillsbury dough. You will see how it breaks apart, and how to cut and re-shape the dough. And if you get stuck, email me, or tweet me @tasteblog and I will help you. Do try it, so cute, fun, delicious. It really works, especially if you are not a baker (like me). WOW! Now those are some delicious looking sliders! What a way to enjoy grilled scallops. Beautiful presentation! You had me at “grilled scallops” 🙂 The sliders look adorable: what a neat idea. 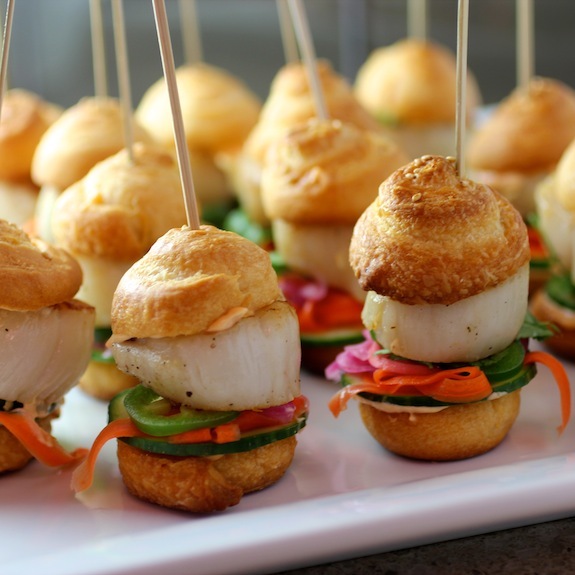 I looooove banh mi and these scallop sliders are SUPER adorable. I never had scallop like this. Such a fun and brilliant idea. I always enjoy getting surprise presentation/ingredient/menu/photography (and everything) from your blog – such a wonderful inspiration! You are so talented!! I am making these ASAP! Thank you for sharing!